Help Aelwin contribute to his retirement savings by obtaining the scales from some Rumare Slaughterfish for him to sell. Find Aelwin pacing around his house and speak to him. He will ask you to obtain a dozen Rumare Slaughterfish scales. Dispose of the Slaughterfish and return to him for the Jewel of the Rumare. Aelwin Merowald can be found walking around his house in Weye after about 7 or 8 in the morning. Talk to him and go through his dialogue in order to receive a quest to kill twelve Rumare Slaughterfish. When talking to him, it is advisable to not select the option to laugh at him, since laughing will decrease his disposition towards you by 60 points and end the conversation. If you lower his disposition below 20, he will not even start a conversation with you; a Charm spell will be necessary to get his disposition over 20 and receive the quest. Follow the quest marker to find and kill each fish. It may be necessary to search the area around where the marker points because it is not always accurate. The Detect Life spell is useful for locating the fish. It is also much easier to fish during the day. Once you've collected the scales from the first fish, the marker should point to the next one (there might be a short delay). If the marker doesn't update, try hitting the fish's corpse or leaving and waiting for a few hours somewhere else. Continue this until you have all twelve scales. The quest isn't timed and the fish don't move, so you do not have to complete it all at once. Talk to Aelwin again and he will give you a unique ring called the Jewel of the Rumare, which is enchanted with Water Breathing and Fortify Athletics 4 points, a rather nice reward for such a simple task. Aelwin mentions that the fish scales will be sold to an alchemist and the money made will contribute to his savings for his retirement. If you are the thieving type, select the Where are your savings? dialogue option. If you increase his disposition to at least 70, he'll mention that his savings are locked in a box in his house and he has the key. After Aelwin tells you this, you can pick his pocket for the key or kill him and take it. The chest is located to the left of the fireplace in his house, though there is only a small amount of gold in the chest. Note that the key will not appear in his inventory if you do not successfully ask him about his savings. Although the quest journal says that the Weye settlement is southwest of the Imperial City, it is actually due west. The quest journal states that Aelwin is getting too old, therefore you need to do the legwork for him. Aelwin however says the reason he can't get the scales is because a slaughterfish injured his leg. After you finish the quest, you can pickpocket Aelwin and take back the Rumare Slaughterfish Scales, but it's not recommended to do so as they are still classified as quest items and can't be sold or removed from your inventory. They will also be stuck in your inventory if you happen to collect the scales but Aelwin dies before you can hand them over. Aelwin is located very close to the wilderness, so he might wander off and feed the local wolves. If that happens, you will have to resurrect him using the console, using the command Resurrect 00185FE1, but on Xbox or PS3 you cannot complete the quest. The only way to get the Jewel of the Rumare is if Aelwin hands it to you; the ring will not be on his corpse if you kill him. It is not advised that you kill the fish before making the quest active, as it may lead to the marker indefinitely pointing to the first fish. There seems to be a problem for some players, for whom the quest marker is stuck pointing at the location of the fish that has just been killed. Using the Console to creating the scales in your inventory doesn't make the quest continue. However if the scales are put into a body of a quest spawned fish then pick them up it will trick the game sometimes. Using the Resurrect command in the Console on the corpse of a previous fish and then killing it again can be used to advance the quest if the player has already killed one and the corpse is still present. Alternatively, simply search the lake for other Rumare Slaughterfish (see next tip). Unfortunately, this can be a slow and frustrating business. However, it is possible to use the console to spawn new fish directly in front of you: player.placeatme <formid>, where <formid> ranges from 00068825 through 00068829 (see Rumare Slaughterfish for details). A fish sometimes spawns out of the water or stuck inside a rock in the lake, making it difficult or impossible to attack it. The same notes about the bug above also apply here. An area-of-effect Command spell can be used to relocate the fish, or an area attack spell used to kill it, if it's within range; but you may have to reload an earlier save. Some of the Rumare Slaughterfish spawns are not initially disabled properly which can lead to the quest incorrectly updating stages if the player picks up the scales from the corpses. This will then cause other stages to misfire, leading to the quest not enabling new targets when it should. Aelwin's retirement savings chest was supposed to contain a minimum of 500 gold (a fixed amount combined with a leveled amount), but due to an engine bug the 500 never appears, only the much smaller leveled amount. Each time you ask Aelwin "Where are your savings? ", a copy of his key is added to his inventory, meaning he can end up with several copies. 10 Aelwin Merowald at the Weye Settlement southwest of the Imperial City is looking to acquire 12 Rumare Slaughterfish Scales to sell to a customer. He's asked me to do the legwork, as he's getting quite old and can't handle the difficult task. 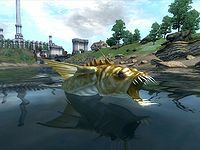 The Rumare slaughterfish is a special breed of slaughterfish that can only be found in Lake Rumare, directly north of Weye. 90 I've acquired 12 Rumare Slaughterfish Scales. I should bring them to Aelwin Merowald at the Weye Settlement as soon as I can. 110 Finishes quest Aelwin Merowald at the Weye Settlement needed 12 Rumare Slaughterfish Scales. After berating me for fishing "his" waters, he traded me an amulet for the scales. 200 Finishes quest With Aelwin's death, it is impossible to complete this quest. It is possible to use the console to advance through the quest by entering setstage SQ09 stage, where stage is the number of the stage you wish to complete. It is not possible to un-complete (i.e. go back) quest stages. See SetStage for more information. This page was last modified on 9 July 2018, at 03:33.